On the heels of his arrest this weekend, Los Angeles prosecutors have formally charged Robert Durst with first-degree murder in the death of his friend Susan Berman in 2000. Berman was Durst’s closest confidant following the disappearance of his wife Kathleen in 1982, and she was found in her L.A. home with a gunshot wound to the head shortly after New York authorities said they would reopen the case. Legal experts believe Durst’s muttered bathroom confession that he “killed them all” in the finale of the HBO docu-series The Jinx could be admissible evidence in court. According to USA Today, the charge carries the “special circumstances of murder of a witness and lying in wait,” which makes Durst eligible for the death penalty, though L.A. prosecutors have yet to decide if they will seek it. Where Does the Robert Durst Case Go From Here? 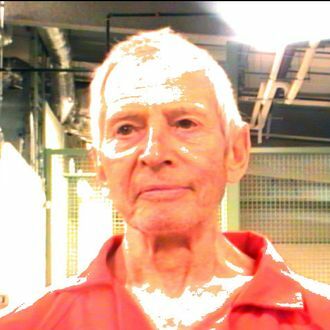 In a Louisiana court on Monday, Durst waived his right to contest his extradition to California to stand trail for murder. However, that move may be put on hold, as New Orleans filed its own charges against Durst on Monday evening. He was found in his hotel room with a .38-caliber revolver and a small amount of marijuana, and has been booked for possession of a firearm with a controlled dangerous substance and being a felon in possession of a firearm.